laws must provide clear protections and effective enforcement of misappropriation and infringement. Online intermediaries should be offered incentives to operate responsibly and should enjoy safe harbor from copyright liability when they do so. This section examines the intellectual property protections in place in the countries studied, as well as their approaches to implementation and enforcement. The Intellectual Property criteria for this year’s Scorecard was extensively revised to focus on issues that are most relevant to cloud computing, including new questions on trade secrets and patents. 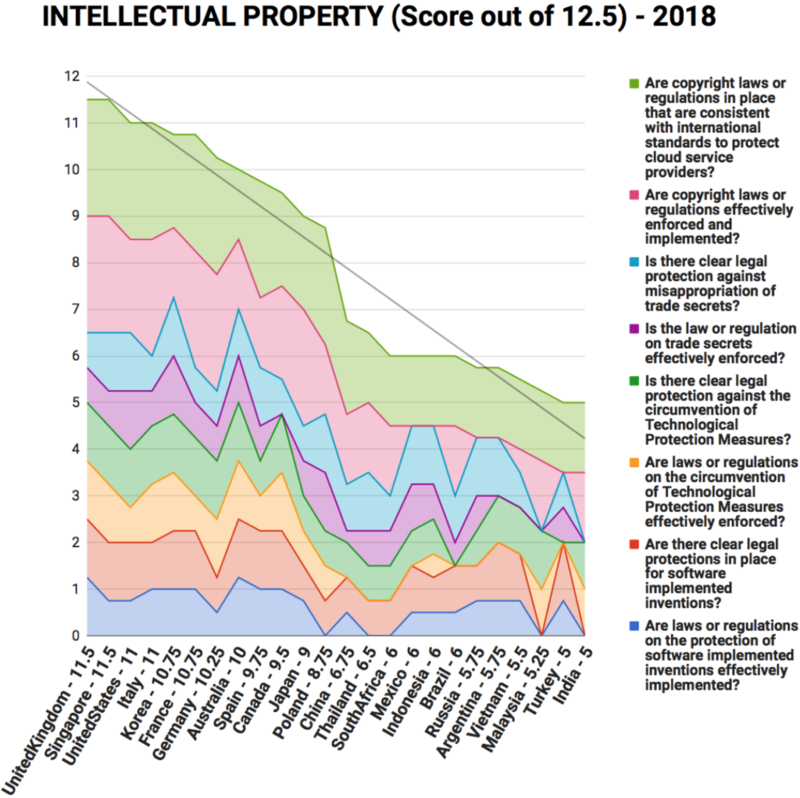 The United Kingdom, Singapore, and the United States all score very highly in the Intellectual Property section, reflecting their combination of modern laws and effective enforcement. Unfortunately, many countries struggled to achieve good results in this section, with Vietnam, Malaysia, Turkey, and India recording the lowest scores. However, numerous proposed and draft laws and regulations exist across the countries in the study, and this may be a section where we see strong improvements in the coming years.